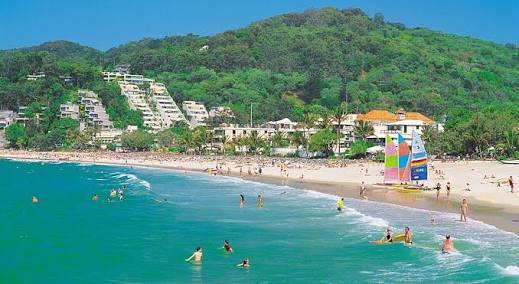 We’ve moved to sunny Queensland – to the glorious hinterland behind Noosa where the beaches are just about the best of any in the world. The main beach has lovely gently waves lapping at the shore and the water is so clear that you can see fish swimming about – even in the shallows. The surf beach is something else entirely – its quintessentially Australia – big churning surf, miles of sand,huge expanses of blue sky and best of all, hardly a soul around. The main beach is safer for swimming but it’s still always something to be able to get in the surf and jump those waves (in Australia we don’t really swim in the sea, we jump waves). The trick is to get out beyond the breakers, which can be scary, but once there the water is just glorious and best of all not the least bit frigid like the oceans down south so its heaven to float about and be rocked by waves, And added bonus is that the water is not frigidly cold like down south. In fact there’s always this lovely surprise when you realise the first waves that crash into you aren’t cold but quite mild (though fortunately not as warm as those flat seas in south east Asia). Our house is a little cottage that has been renovated and extended to encompass a huge verandah and gazebo-like space – plenty of room to have an outdoor table, recliners, outdoor lounge as well as a small pool and space to laze in the sun. Our garden is like a huge park. We could go and have picnics down on the grass amongst the trees except that we’re quite content to sit on our verandah and just look out. There is wildlife: an abundance of birds including kookaburras and King Parrots that come and perch on our verandah, bush turkeys, ducks (the other day I drove past a family of ducks waddling along – Mother duck and her chicks – so cute!) and the occaisional wallaby hopping past. “Town” is a 20 minute drive away – as is the beach – but it’s not like city distances – it’s probably a good 20k. I always find myself thinking how far it is and then I remind myself that back in Sydney it would take that long to go 5k in built up city traffic. So it’s just a matter of changing my perspecttive. The problem is, I feel like I’m somewhere outback. I can’t duck to the local shop for some forgotten item (there is no local shop nearby) and the shops, well, that’s what most makes me feel like I’m in rural Queensland. The other day I was looking for radicchio – readily available in Sydney – I asked everywhere but no, they occaisionally got some in but there wasn’t much call for it. Sigh. Same thing happened with trying to obtain Puy lentils. No one stocks them. Fortunately I found one of those bulkfood places that had them. Whew!! I did think that I’d be sending home for care packages. But my real problem is the lack of service. Digital/technological service. We have no telephone – the line has not been connected to the house; we have no internet – we have ordered a copper cable to be installed but things take time (and time goes by so slowly); we have no tv service – something wrong with the antenna so we can’t watch anything and without internet/broadband we can’t stream anything. Arrgh. More frustrating is the fact that it’s so hard to download anything. I have a SIM in both my phone and iPad but the range here is so bad that I can never connect so it’s almost impossible to download emails, or search for anything. Or post/respond to Facebook. Is that bad? Yes and no. I don’t necessarily need to be connected on social media but I do want to stay in touch. And I want to know what’s happening. I can’t seem to download the papers anymore. I have to go to a shopping centre to do that but its not where I want to sit and read. I’m feeling increasingly isolated. I keep reminding myself that I should regard this as an exotic holiday – like being in the back of Ubud – and it’s an opportunity to not do very much except read and lounge around and go to the beach. But somehow, it’s not very satisfying. This after all, is not an exotic holiday location, it’s my new home. So, it’s a work in progress; an opportunity to drop the city me and accept this new pace of life: slowly does it. The Spaniard says “maniana”. MacTavish says” I’m not familiar with that expression”. The Spaniard replies, “it means, there’s no hurry, tomorrow will do”. MacTavish says “aye, we have a lot of expressions like that here too, but none of them quite so urrgent”.